The Fair will be open from 11 to 27 August at the Parc de Can Robert. 18:00h, Location: Racó de la Calma, TALLERES FAMILIARES (Family Workshops): "Pintem la Festa Major" (let’s paint the Festa Major). 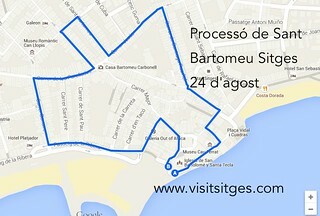 Event organized by Consorci del Patrimoni de Sitges. 16:00h, Location: Escuela Esteve Barrachina, VIII EDICIÓN DEL TORNEO DE FÚTBOL SALA (Hard Court Soccer Tournament) by “colles de Festa Major”. Event organized by Group La SACA - Sitgetana de Cultura i Animació -. 19:00h, Location: Espai Cultural Pere Stämpfli, «Els balls d'antany: les representacions perdudes de la nostra Festa Major», (The dances held in days of old: the lost representations of our Festa Major, a CONFERENCE by Josep Milán Parellada. 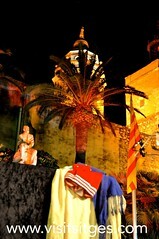 At the end of the talk, the beginning of the Festa Major will be celebrated on the terrace. 19:30h, Location: Edifici Miramar, CONFERENCE «Els gegants moros d’en Querol i els gegants nous. La història mai explicada», Querol’s paper maché Moor giants and new giants. The untold story. By Eduard Tomàs Sanahuja. A glass of cava will be served to celebrate the 120th anniversary of the Centennial giants. Organized by the Grup d’Estudis Sitgetans and sponsored by Pastisseria Roquetes. 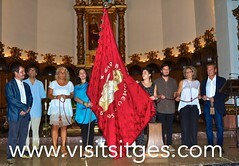 Open during the hours of parish church celebrations: Exhibition of the flag of SANT BARTOMEU. 12:00h. ACOUSTIC CONCERT with Sergi Ramírez and Marc Llorià. Event organized with the assistence of of La Tija, La Palmera Torta and Jardins del Retiro. 18:30h, Vestim els Gegants Moros (Let us dress the "Gegants Moros") a chidren's event in front of the Palau del Rei Moro. 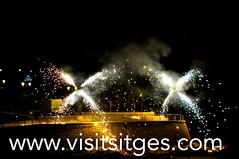 Event organized by the Agrupació de Balls Populars de Sitges. 19:00h "Anem a buscar els Gegants de la Vila, els Gegants Americanos, el drac i l'Àliga" (Let's go for the Gegants de la Vila, Gegants Americanos, Drac and Àliga) a chidren's event in front of the Escorxador. 18:00h Departing from the Parish Church of Sant Bartomeu and Santa Tecla: The Municipal Commission of the Festa Major de Sant Bartomeu and Santa Tecla, representing the municipal authorities, will recieve the icon of Sant Bartomeu from parish vicar Josep Pausas, and to the sound of the Agrupació Musical Suburband of El Retiro, will parade it this year to the home of señor Ramon Soler i Fernández, N. 36 Calle Joan Maragall. 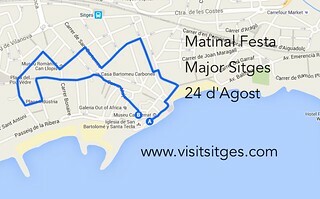 The route will follow the streets of Baluard, Fonollar, Port de n’Alegre and Onze de Setembre. After, inauguration of the exhibition of the image of Sant Bartomeu open until 21:00h. 20:00h, Passeig de la Ribera, “Habaneras” concert by "Els Pescadors de l'Escala". The typical "rom cremat" will be offered. On the Plaza Ayuntamiento, by the Sitgetan theater group of Les Veïnes. 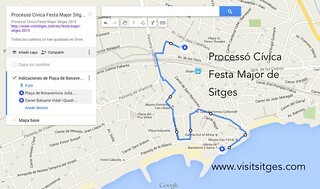 This year the Pregó (Festa Major Street Cry) will be broadcast live at the Fragata. In the case of rain or bad weather, the proclamation will take place in the parish church. A glass of Cava (Perbacco) and a taste of La Sitgetana will be offered. Exhibition open from 10:30h-13h and from 17h - 20h. 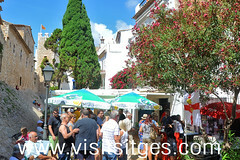 13h, FESTA MAJOR VERMOUTH Location: Ateneu Popular de Sitges, street del Sol, number 2. Live music with the group Carles Belda & Joan Garriga. 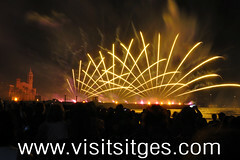 Event organized by Ateneu Popular de Sitges. 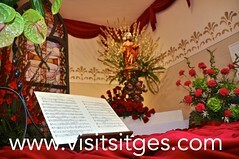 In the Parish of Sant Bartomeu and Santa Tecla, event with poems and singing of Sant Bartomeu "Goigs". This year, the author of the Poem of the Flag is Marc Hill i Gumà. Followed by the musical group "Agrupació Musical Suburband del Retiro" parading to the home of the President of the "Commissió", Cisco Arbonés. Route: Baluard, Plaça de l’Ajuntament, Major, Cap de la Vila, Jesús, Francesc Gumà, Hort Gran, pont de sota la via, avinguda de les Flors, Sol, Camí de la Fita y Estalvi. With the arrival of the Flag to Plaça Catalunya, NIT DE FESTA MAJORENCA, with a popular dinner with a cost of 5€. Tickets on sale at pastry shop Calderón, Ojeda hairdressers, cafeteria La Placeta, carpenters Joan Yll and La Botiga de la Bel. The event will be livened up by the group El Duet. Event organized by the Comissió de Festa Major with the asssistance of frutería Albert i Anna. Starting at 21:00h, in the Hort de Can Falç, YOUNGSTER’S NIGHT. DJ's Miku, nOgs and Dj’s who are learning to spin at the Espai Jove, will keep us dancing until midnight. Act organized by the Youth Department. 12:00h. Arrival of the "Grallers"
The different groups offer their inaugural concert in tribute to the founders of the Festa Major. 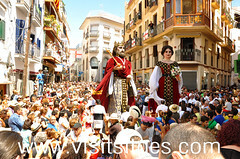 Procession along the streets of Sant Francesc, Cap de la Vila, Major and Plaza Ayuntamiento. 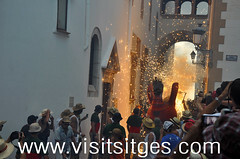 Arriving at Hort Can Falç and at the Hospital de Sant Joan Baptista, groups will perform the full dances and there will be speeches (Ball de diables, Ball de Cercolets, Ball de Gitanes and Ball de Pastorets). Cercavila (circuit around town with the authorities, the Saint and the folkloric dances and musicians), from Carrer Estalvi number 5, home of the President of Comissió de Festa Major, Cisco and Arbonés Heredia. The group of traditional dancers and musicians will recover the shrine of Sant Bartomeu from the home of pendonista of the Festa Major 2017, Mr. Ramon Soler i Fernández. Route: Estalvi, Cardenal Vidal i Barraquer, Verge de la Llum, travessera Àngel Guimerà, Àngel Guimerà, carretera de les Costes, Aragó, Sant Honorat, Pompeu Fabra, Felip Massó, Mas i Font de Vila, Onze de Setembre, Port de n’Alegre, Fonollar and Baluard. 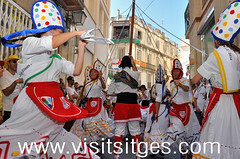 In front of the doors of the parish church, the popular dances receive the image of Sant Bartomeu who, accompanied by the authorities, and the “Pendonista” and “Cordonistes” will be placed in the presbytery to preside over the liturgies of the festival. "Castell de Foc en Calma": chairs and a glass of “cava” Maria Casanovas Brut de Brut. on the Passeig (promenade) between restaurants Pic Nic and Kansas. 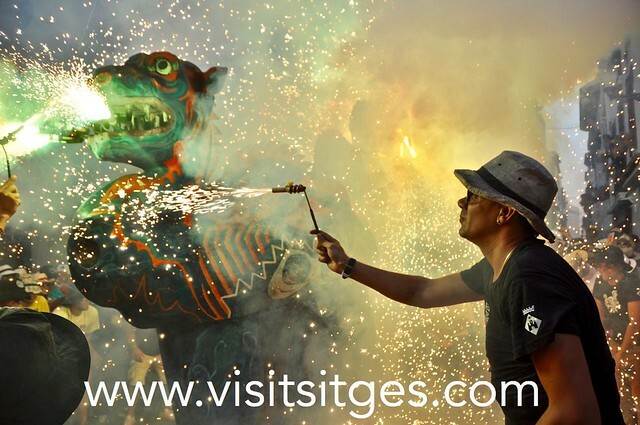 The tickets will be sold at the stand of the Commissió Festa Major on the Cap de la Vila and in the Tourist Office of Sitges. Price 5€. Disabled persons free. Verbena Sardanista (Sardana's eve) with La Cobla Sitgetana. Location: Cap de la Vila. Verbena de Festa Major with the performance of the DJ's Lagarto y Kimberly & Clark untill 04:30h. Location: Passeig de la Ribera. 6:00h. Joyful and festive "matinal"
From Miquel Utrillo and Morlius Baluard, the "matinal" begins and the folkloric dances follow an itinerary through the streets of town while flowers are handed out to lady spectators by "la Comissió". People can join in the "passada de faxes" (one must be dressed in white and wear "espardenyes de betes" (espadrilles with ribbons) and a "faixa" (waistband in the fashion of the castellers). Route: Baluard, Fonollar, Baluard Vidal i Quadras, Port de n'Alegre, , Rafel Llopart, Sant Damià, Sant Sebastià, Jesús, Sant Bartomeu, Sant Gaudenci, Sant Josep, Espalter, Plaça Pou Vedre, Bassa Rodona, Joan Tarrida, Plaça Indústria, Marquès de Montroig, Parellades, Cap de la Vila, Major and Ajuntament. Presided over by Father Josep Pausas, rector. This year, the group Les Gitanes de la Vila will do the offering to Sant Bartomeu because of the commemoration of its 40th anniversary. At the end of the celebration, song of the Goigs of the Saint in charge of the Choir of the Amics del Orgue and veneration of the relic. The band accompanies the authorities to the Town Hall and after all the dances and their musicians cover the small distance between the parish church and the town hall, the sardana Festa Major is played by La Cobla Sitgetana. The band will play Els Segadors, the national hymn of Catalonia. 13:30h Location: In the gardens of the Sociedad Recreativa El Retiro with Agrupació Musical Suburband de El Retiro. 13:30h Location: In the gardens of the Casino Prado Suburense with “Solistes de la cobla”, interpreted by La Cobla Maricel. Presidided over by Father Josep Pausas, with the presence of town hall dignataries and the Flag of Sant Bartomeu shall be carried by the pendonista Ramon Soler i Fernández and the cordonistas: Josep Maria Rosés i Castro, Josep Gràcia i Garcia, Jordi Cubillos i Almiñana y Àngel Lorenzo Polo. Route: Baluard, Fonollar, Sant Joan, Davallada, Barcelona, Santiago Rusiñol, Jesús, Sant Bartomeu, Sant Gaudenci, Sant Francesc, Cap de la Vila, Parellades, Bonaire, passeig de la Ribera, Nou, Major, Plaça de l’Ajuntament y Baluard. 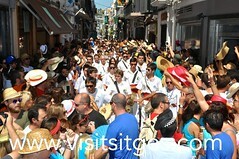 As the procession advances along the Paseo de la Ribera, the town patron, La Cobla Sitgetana will interpret the sardanas Els Gegants de Sitges and La Processó de Sant Bartomeu, composed by Tomàs Gil i Membrado and Antoni Català i Vidal respectively. On the Paseo de la Ribera, Great Dance of Festa Major by Jukebox (Fede Guitar & Marc Vaccaro), the music group Kuéntame Como Sonó and DJ Dani Empa. Location: La Vall (behind the Palau del Rei Moro and in front of Bar Restaurant La Guineu). The event will feature a performance of group “Les Guineus del Dixie”. A new vermouth "India", will be served. Organised in collaboration with Bar Restaurant La Guineu . 21:00h. 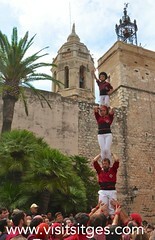 Special Rehearsal of the Colla Jove Castellers Sitges at the Palau del Rei Moro. Event open to all. After, dinner open to all. 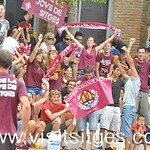 Event organized by the Colla Jove de Castellers de Sitges. 22:00h. Passeig de la Ribera, Concert-Ball de Sant Lli with La Chatta orchestra and DJ Miku. Location: Hort Can Falç with Josep Delgado. 20:00h, Location: Paseo de la Ribera, MASTERCLASS of SALSA and EXHIBITION, by Marisa Salas Dance School. 22:00h, Paseo de la Ribera (on the promenade), CONCERTO by Rum Rain , Calima and The Big Bang DJ’s . 21:30h In the gardens of the Casino Prado Suburense, DINNER PRADO FESTA MAJOR. Dinner accompanied by the show Carrusel d’Estiu. Through out the evening, the Pubilla (queen) del Casino Prado along with the Pubilla and the Hereu of Carrusel 2017 will be introduced. Reservation and ticket sales at the secretariat of Casino Prado Suburense. 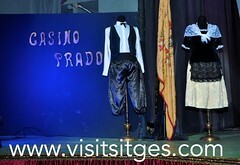 Event organized by the Casino Prado Suburense. 22:00h, Location: Gardens of the Societat Recreativa El Retiro, DINNER-BALL OF MARRIED COUPLES with musical performance by Andreu’s Quartet i Disco Marin. The Pubilla and Hereu del Retiro 2017 will be announced that evening. Tickets and information at the secretariat of El Retiro. 12:00h, Location: Paseo de la Ribera (Prommenade). RUMBERMUT with Marcel&Ismay followed by a BOTIFARRADA POPULAR (a big sausage cookup). To finnish, dance to Veneno en la Piel. Price 5€. Tickets for sale at Janio’s Bar. Location: Plaza Ayuntamiento with the groups "Minyons de Terrassa", Castellers de Sabadell and "La Colla Jove de Castellers de Sitges"
22:00h, Location: Church of Sant Bartomeu & Santa Tecla, ORGAN CONCERT of Sant Bartomeu, by Loreto F. Imaz (Donostia). Voluntary entrance fee. 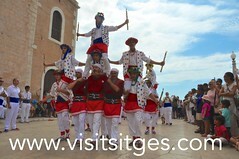 Act organized by the Amics de l’Orgue de Sitges.